Heto na! After months of research, we finally came up with a design process that we think will fair up to the standards of our market. The finished product can be compared to that of the design of Tech Deck in the sense that the graphics is embedded on the bottom ply of the deck before finishing the whole deck with a special acrylic that act as a protection to the deck making it water proofed. You can see the photos below. 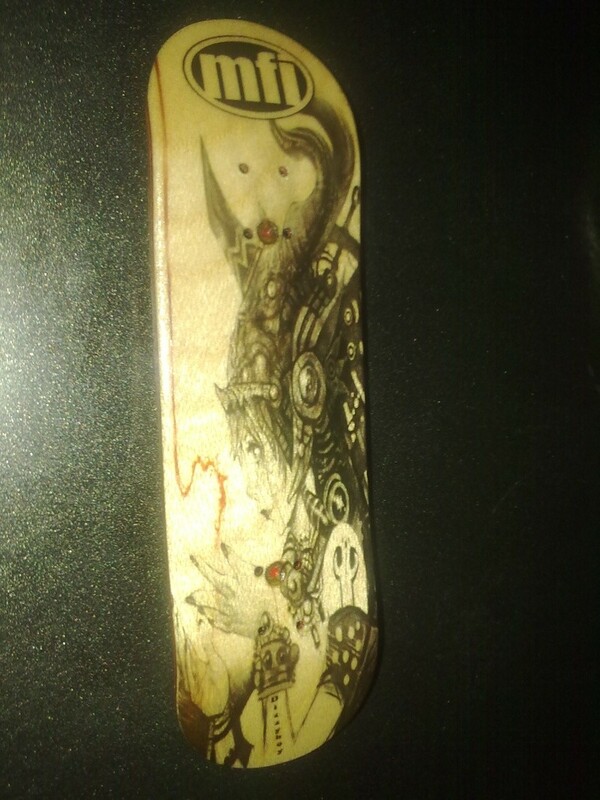 This deck is supposed to be just a sample, the graphics was originally hand drawn by Allen (dalirinibadjula). When the final product came out (from dizzyboy), madaming nagandahan. So instead of giving away an MFI basic deck as one of the prizes in BAI2, we decided na ito na ang pamigay. So there it is! Enjoy! astig. sana meron dn ako nyan. sarap magkaroon nyan. !!!!! lumelevel up!!! ASTIG! sir pwd b ung sarili n design? i got the power! anong power ba yan? haha konti na lang susunod na yung MFI riders deck dyan!! !